Department: Commercial Litigation, Contentious Probate, Dispute Resolution and Employment Departments. 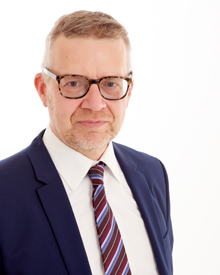 David is an experienced litigation solicitor who recently relocated from the South East of England, having worked for 29 years in central London and the Home Counties. David has a wide range of experience gained from general practice including commercial disputes, complicated money and debt claims, credit agreements, domestic and commercial property issues, boundary disputes, shareholder and unfair prejudice claims, disputes involving wills and misuse of powers of attorney. David has a particular interest in contested probates and was instructed on the leading Court of Appeal mutual wills case with his previous firm. David works in an open and approachable manner with his clients, providing the experience and expert grasp of his area of law with straightforward advice, focused on the commercial implications. David appreciates that litigation can be emotionally draining, stressful and expensive. Wherever possible David is committed to finding cost effective ways to resolve disputes through mediation and other alternatives to court.